JazzStandards.com was developed by Jeremy Wilson, a jazz fan and information management specialist. When looking for documentation on jazz standards in 1999, he found the documentation was available, but spread out and in need of centralization and preservation. Using newspaper archives, liner notes, websites and books, many of which are out of print, he documented the origins of the top 100 jazz standards. With help, 200 more have been documented and more are on the way. Sandra Burlingame is the editor of Sing Your Story by Jay Clayton, Metaphors for the Musician by Randy Halberstadt, and Tapping the Source by Brenda Bufalino. She also contributed to Jackson Street after Hours by Paul de Barros. She is a former member of Earshot Jazz Board of Directors, editor of its magazine, and publisher of 5/4 Magazine. For JazzStandards.com she has written hundreds of biographies, book reviews, and edited nearly everything else. Chris Tyle is a multi-instrumentalist performing classic jazz; that is, jazz music from the very beginnings in New Orleans up until the bebop era of Charlie Parker and Miles Davis. For ten years, six nights-a-week, from 1992 until 2002 he led his Silver Leaf Jazz Band at the Can Can Jazz Cafe on Bourbon Street, New Orleans. Tyle has researched the history of jazz music for more than 30 years and is termed “An expert on early jazz,” by Scott Yanow, author and editor of the All Music Guide to Jazz. For JazzStandards.com he has written the Jazz History in Standard Time pages and the Jazz History Notes for the top 200 standards. One of the CD’s by Chris Tyle’s Silver Leaf Jazz Band, New Orleans Wiggle, has been given a four star rating and a special “crown” by the Sixth and Seventh Editions of the Penguin Guide to Jazz. Out of approximately 10,000 CD reviews in the Guide, only 152 recordings have received this rating (see our home page for more on the review). 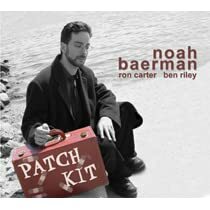 Pianist Noah Baerman earned Bachelors and Masters degrees in Jazz Studies from Rutgers University, studying under Kenny Barron. Noah’s widely acclaimed 2003 release Patch Kit raised funds and awareness for Ehlers-Danlos Syndrome, a connective tissue disorder with which he was born. The album, featuring bassist Ron Carter and drummer Ben Riley, gained substantial press and radio airplay nationally and led to an appearance for Noah on Marian McPartland’s NPR program Piano Jazz. Noah’s fourth album, Soul Force was released in 2005 and is a tribute to the life and message of Martin Luther King. “Soul Force” features his trio alongside a wide array of guest musicians including trombonist Robin Eubanks and saxophonists Steve Wilson, Jimmy Greene, Wayne Escoffery and Claire Daly. Noah is active as an educator, teaching privately and at several institutions including Wesleyan University, Central Connecticut State University and Charter Oak State College. He has written eight books for the Alfred Publishing Company. His most popular books are the three-volume Complete Jazz Keyboard Method and the Big Book of Jazz Piano Improvisation and in 2005 Alfred published Noah’s first instructional DVD. He is a prolific composer as well and in 2006 earned First Prize for jazz in the Billboard Song Contest. Peter Spitzer is a saxophonist, educator and writer based in the San Francisco Bay Area. As a performer, he he has played countless engagements, in many musical genres. He has taught both privately and in classroom settings for over 30 years, at all age levels. He is co-owner of Hope Street Music Studios in Mountain View, California. Peter received an MA (Music) from San Jose State University, and has studied privately with Paul Pone, Eddie Flenner, and Joe Henderson. He is the author of the Jazz Theory Handbook and the Easy Classics series (Mel Bay Publications). For JazzStandards.com he has written the Jazz Theory pages. K. J. McElrath has worked in jazz performance, musical theatre and music education for over twenty-five years. A composer of several works for winds and orchestra, his pieces for jazz ensemble have been published by Kjos Music Co. of San Diego. He holds a Master’s Degree in Composition and Theory from Central Washington University, where he studied with Professor John Moawad. His unique approach to both jazz piano performance and arranging involves the frequent use of counterpoint. For JazzStandards.com he has written Musical Analyses for the top 200 standards. Ben Maycock is a freelance writer, researcher and editor. A fervent jazz fan he is a regular reviewer and contributor to Planet Jazz magazine. He spends his time shuttling up and down the Atlantic coast between Nantucket, Massachusetts and Nova Scotia, Canada. His wife Jennifer and a manic Jack Russell named Pipa keep him in line. Terry Perkins is a freelance writer based in St. Louis, Missouri. Terry has been writing about jazz for more than two decades for The St. Louis Post-Dispatch, Downbeat magazine, AllAboutJazz.com and other publications and websites. He also writes and produces corporate communication videos. When he isn’t listening to music or writing about it, you can usually find Terry somewhere near a trout stream, at a Cardinals baseball game or rooting for his alma mater, the University of North Carolina at Chapel Hill.